Talking trash-A problem we all need to deal with and be talking about. I cannot stress enough the importance of cleaning up our trash. In my younger days, the message wasn’t as strong as it is now. Maybe that’s because it didn’t seem as dire back then. Like sunbathing where we used to lay out and bake in the sun all day with nothing more than baby oil…and now we pay the price. We didn’t know it was bad for us…until it’s too late. Now we know better and hopefully act more responsibly. It is the same with trash and our environment. It is getting bad out there! I recently had the privilege of getting a behind the scenes tour at the Loggerhead Marine Life Center. Part of that tour involved going into the hospital where I got to see some new patients and also the albino hatchling which I posted a photo of on the TurtleLady Art Facebook Page. It is a gem of a facility and well worth a visit if you are near the area. As interesting and as fascinating as I found the day, one of the things that has stayed with me and crosses my mind very often was the visual of a bag of plastic. Just a simple bag of plastic trash. But it’s deceptive. That bag of plastic had killed. That one bag of colorful bits had all come out of ONE sea turtles stomach. Seeing that bag-holding that bag; knowing what happened because of it affects you. If ever there is a lesson about cleaning up the literal sea of debris that is in our environment, that bag of plastic is a strong one. Over the years my family and I have been a part of many beach cleanups-both organized and those of our own making. I am proud that my children know the importance and continue with this in their own way and on their own time. It is also through them that a small new .com came onto my radar. A young enterprising college student, who is collecting trash from a beach and packaging it artistically in clear boxes to sell. In talking to him he said this was his way to showcase the problem in a way that won’t hide the problem—but get people to talk about it. Attractively display trash by putting it out in the open for people to talk about it. He feels you have to be aware of a problem to work on solving the problem. I immediately offered to post a few of these on my website, help him sell them and certainly to write about them as I am doing here. It just struck a chord with me. 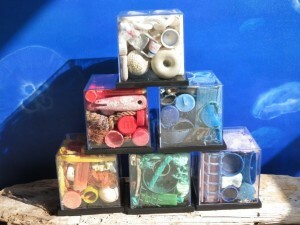 So you will see these “TideTrash” boxes on TurtleLady.com in the very near future and possibly in a store near you soon. Just to be clear and put it out there, I make nothing off of these. All proceeds will go back to the young man at TideTrash.com and he is giving a percentage back to specific causes and using the rest to go back to the beach and collect more trash. I admire what he is doing. He has a name and the drive, but no website yet. Each cube is different and I think they are each actually pretty interesting. The initial price may seem a bit high for trash, but think about the price the environment and the creatures that inhabit it, who pay for it every day. I think they are worth it—and the lesson these cubes remind anyone who sees them is a priceless one. Plastic is getting talked about. Which brings me to a recent article about the garbage on even remote beaches in the most current edition of “Southern Boating” Magazine. It is the “Sea Watch” column written by Jean-Michel Cousteau (a name many are familiar with). It is a disturbing but worthwhile read to anyone concerned about this issue. The photos, like the plastic bag I mentioned, stay with you. So while you are reading about all the problems with the rubbish on our beaches all over the world, I guess the good news (and I love good news!) is that we can do something about it. Each and every one of us is capable of making a difference. Cleaning up the trash is something that we can physically do no matter where we are, but any reason to take a walk on the beach is something to embrace. To take it a step further, think about writing to our large corporate giants that are still using single-use plastic straws and tons of plastic packaging daily and asking them to make a change. There are alternative products out there, but if we don’t make a little noise, they won’t hear us. I think we have all seen the viral videos of sea turtles getting plastic straws stuck in their noses. It is so sad and unnecessary! Plastics made from corn and other food products are out there. And the packaging that goes into getting all those items into the big box stores on every corner—it is frightening! The vast quantities of plastic used is staggering!